Stone looks great on the floor, but it's not easy, even from the get-go. For one, real stone is massively heavier than ceramic, which accounts for higher shipping costs. For another, some installers, accustomed to the simplicity of ceramic installation, hesitate to deal with natural stone. Once laid, real stone requires maintenance. For example, travertine needs to be initially sealed--and sealed again on a regular basis. Not something you would expect from a stone thousands of years old. Which is why many homeowners who want the look of stone but not the expense and hassle, turn to ceramic/porcelain tile that cleverly mimics stone's appearance. Ceramic tile installs easily and costs far less than stone. Would the porcelain pass muster if you got down on your hands and knees? No. If you really got down to it, you could tell the difference. But that's not the point. Flooring does not need to pass the test on a microscopic level; it's something you see (and hopefully admire) from a standing view or upon entering the room. Of all the types of stone that porcelain mimics, the marble-look is the most successful of all. These are big, 20" squares of polished porcelain. Because they are porcelain and have a water absorption rate of less than 0.50% (meaning they absorb less than half of one-percent of their weight in water), they are perfect for high-moisture environments such as bathrooms. This is a polished porcelain tile in squares that are 24" x 24". With its light yellow and pronounced variegation, it replicates the look of Siena marble. It is appropriate for all installations--floor, counter, wall, backsplash, and even for pool surrounds. This is a cheerful, bright tile that is perfect for a summer house or for a room that receives a lot of sunlight. Del Conca calls this Modus Gray, a porcelain tile that looks like stone, though the exact type is not specified. 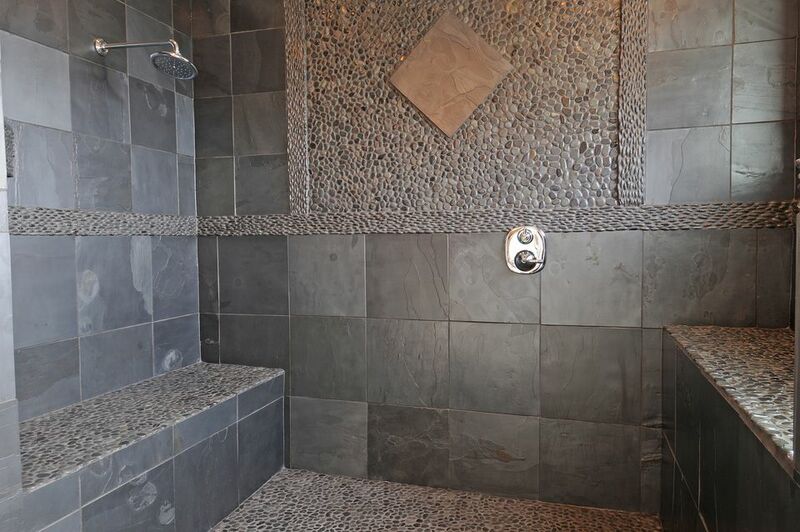 HTS 10 is the 16" x 16" squares you see on the floor, and Mosaico HTS 10 the 12" x 12" sheets of mosaic tile you see on the curved, inner part of the shower. This is Del Conca's Les Baux Aux Provence line of full, through-body porcelain tiles that have the look of red quarry tile (quarry tile is not natural stone). It is appropriate for either interior or exterior installations. One nice bonus is that this line has a number of smaller accompanying decorative pieces, measuring 2 3/8" x 2 3/8", which can be used to finish off corners or to create bands. Not marble. This is porcelain tile measuring 18" square, interspersed with beautiful highlights of pink and red. It's a very bold look, and Del Conca simply calls this line "The Stone." This color is not for everyone. If it's too much, you can find a toned-down version in their HTA 5. It's like Bedrosian's Carrara Marble, but with more pronounced swirls of gray. Green Marble-Look Porcelain Tile. © Nemo Tile Co. I haven't seen a lot of this around...it's a fully vitrified porcelain tile with through-body veining with a green color. A rarity. This comes from Nemo Tile Company and it's part of their Alabastro collection. Yes, a 10" x 20" full-body porcelain tile with the uneven, ridged appearance of stacked ledgestone. It's from Nemo Tile's Trend line. This particular tile is called Tulsa. The only thing to note is that this ledgestone is not randomized enough and thus it has a regular, patterned appearance. However, this can be an attractive look when you are dealing with smaller applications such as fireplace mantels.